The quarter for financial reporting done by all the Commercial REITs is almost over. This is the last quarter of 2016 and it looks like the REITs have made it through a rather challenging year. It is good for us to do a stock take. These 5 REITs predominately have office property in Singapore. 4 of them with Grade A prime properties and Frasers Commercial have 50% in Singapore Grade B and Business Park and 50% in Australia. Keppel REIT have 10% in Australia. Majority of Suntec’s asset comes from their retail operations. The 5 REITs have perform ok in terms of improving their DPU. Suntec have been doing well, while OUE’s DPU growth comes much from its rights issue acquisition. 2016 is a year where there are much office supply to be absorbed, together with a challenging economic situation. 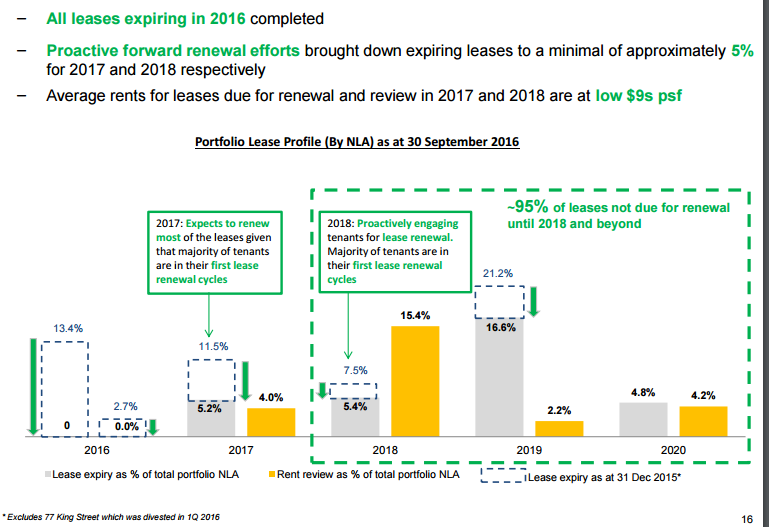 The REITs, in particular Capitaland, Keppel and Suntec was able to renew, and forward renew since last year and attempting to secure for the next year. Frasers Commercial, is weigh down pay the redevelopment of China Square Central’s hotel development. Valuation wise it looks like Keppel, Suntec and OUE have the bigger discount to net asset value. They so happen to be the ones which I feel are more aggressive in valuing their properties higher. 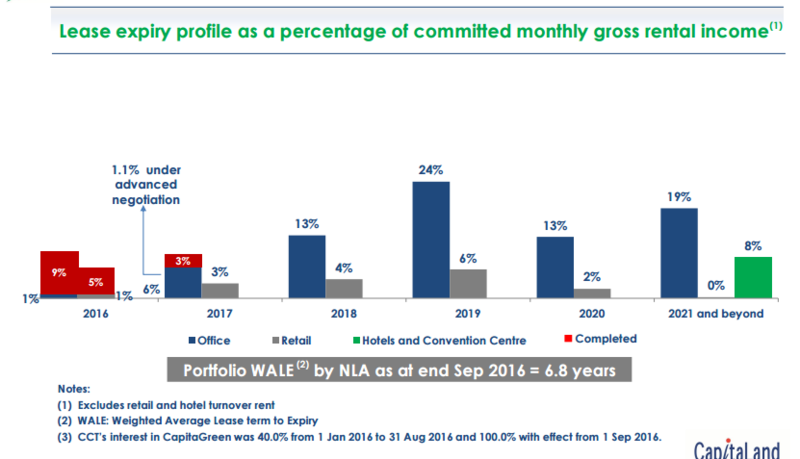 Keppel and Capitaland have some rather long lease expiry (WALE) and debt expiry (WADE). 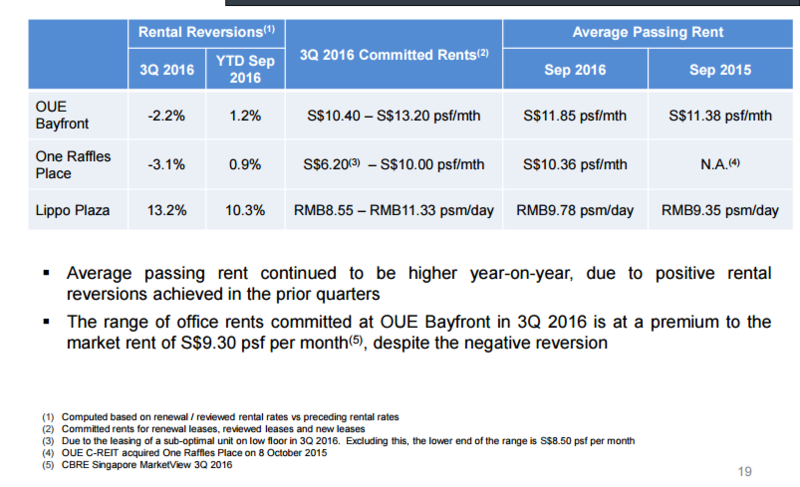 Keppel REIT have managed to have a +3% rent revision (not shown on this slide). 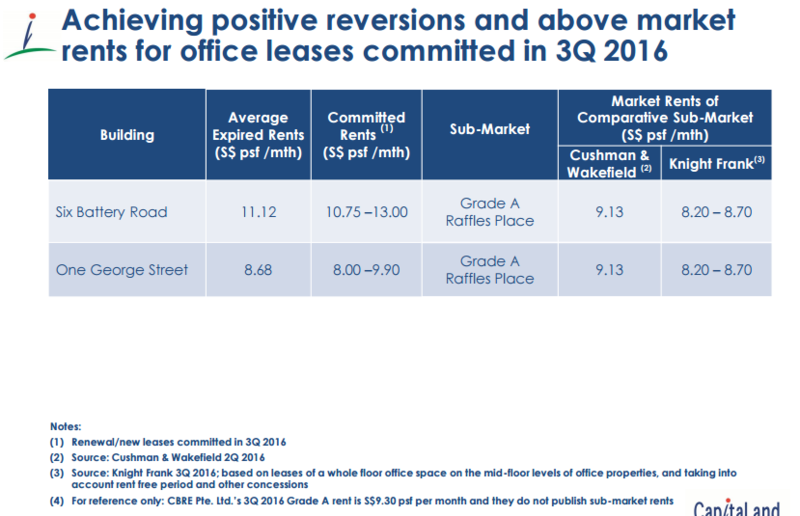 Since most local office rent tenure is 3 years, They are renewing at almost the same rate as 2013. 75% of new leases was attributed to flight to quality, where tenants move to newer premises from possibly Grade B offices. Capitaland Commercial provided better breakdown. 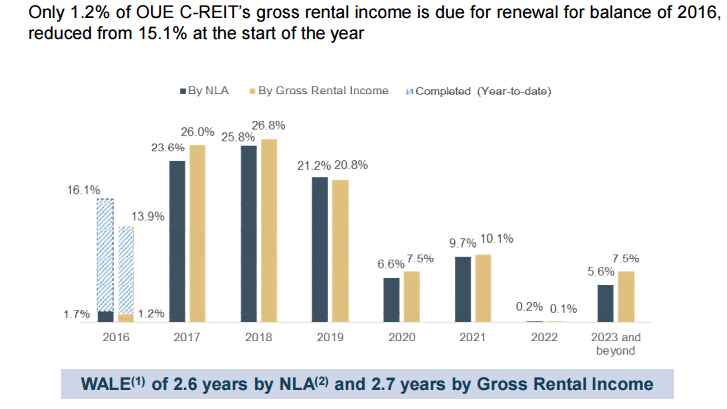 Their rent renewal also coincide with the last rent renewal 3 years ago. 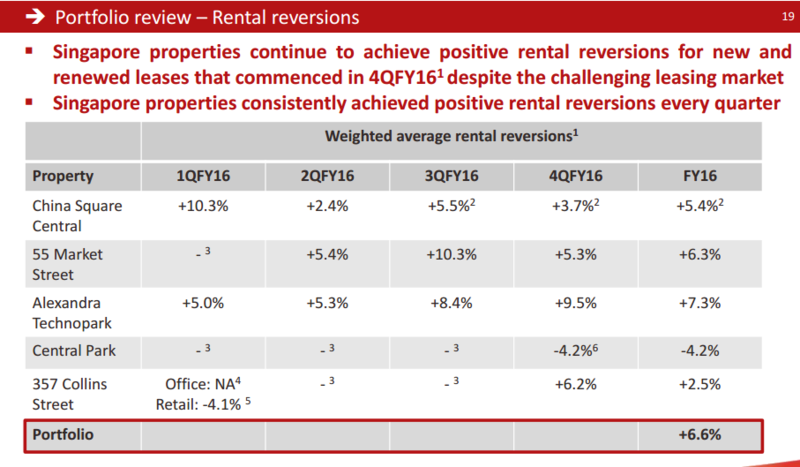 OUE commercial have a poorer showing with negative local rental revision. However in the grand scheme of things it is manageable and they were able to offset from the good performance of Lippo Plaza. Lippo Plaza, in Shanghai was renewed at a very healthy rate, which is inline with Mapletree Greater China Commercial Trust’s Sandhill Plaza’s 21% revision. Frasers Commercial Trust have a good showing except for Central Park, their prime Perth office building. Perth have a 20% vacancy rate after the mining bust, a rumored -40% rent revision. a -4.2% rent revision is disappointing. That is better than vacancy. 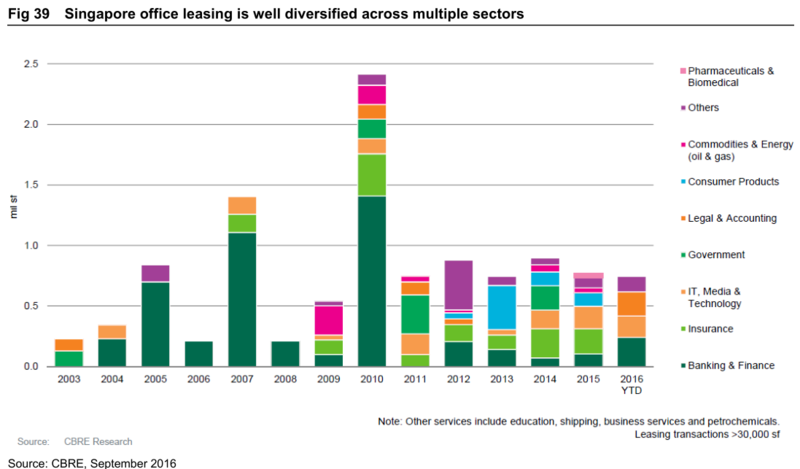 With the office supply coming online in 2017 and the challenging business outlook, we look at which REITs are most exposed to the rent renewal challenges. Keppel REIT have been aggressively renewing their tenants. They probably left 5.2% of the total portfolio net lettable area exposed. The question on my mind is did they renew at this year’s market rent or will agreed based on next year’s rent. Capitaland Commercial are also not quite exposed. They have only 5% to negotiate in 2017. Going forward in 2017, this will be challenging as the rent in 2014 was slightly higher. 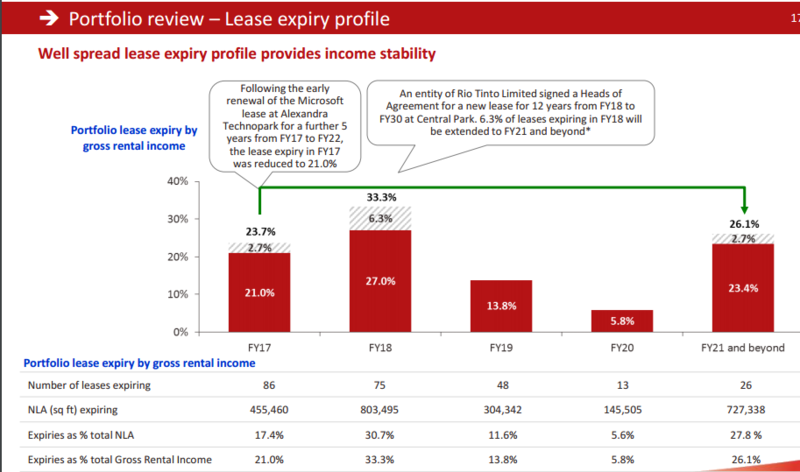 Suntec have a slightly higher lease expiry at 12.2%. Not much is known whether they are proactively securing their existing tenants, but they were able to renew 15% of their net lettable area in 2016. 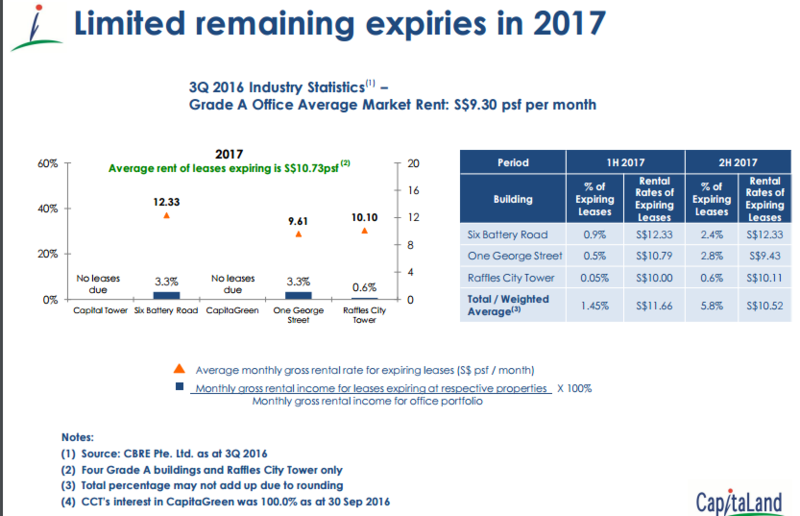 OUE Commercial was able to renew 16% in 2016 and they will have to do even better in 2017 considering they have 24% to renew or re-let in 2017. Frasers Commercial is one of the most exposed as they have 21% up for renewal. Their biggest tenant HP have a new build to suit done up by Mapletree Industrial Trust in 2017, and it is likely that part if not all of it will not be renewed. 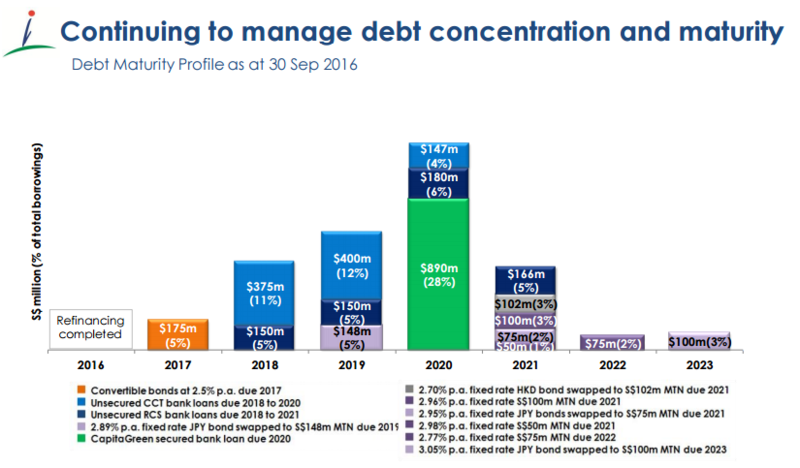 With rising interest rate, cost of debt will be higher. If not in 2017, then it will be in 2018. The REITs will have to live with it. 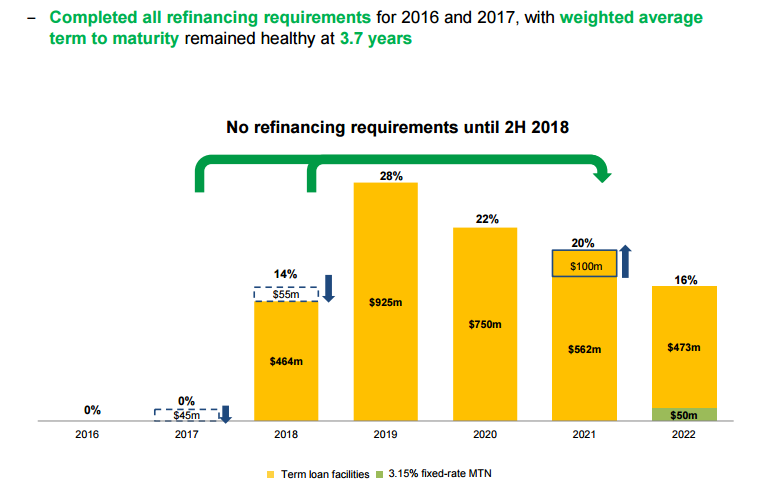 However, if there is a similar credit crunch, those REITs with the most concentrated debt that is expiring, and expiring next year, may face the prospect of having to tap a rights issue to shore up capital. 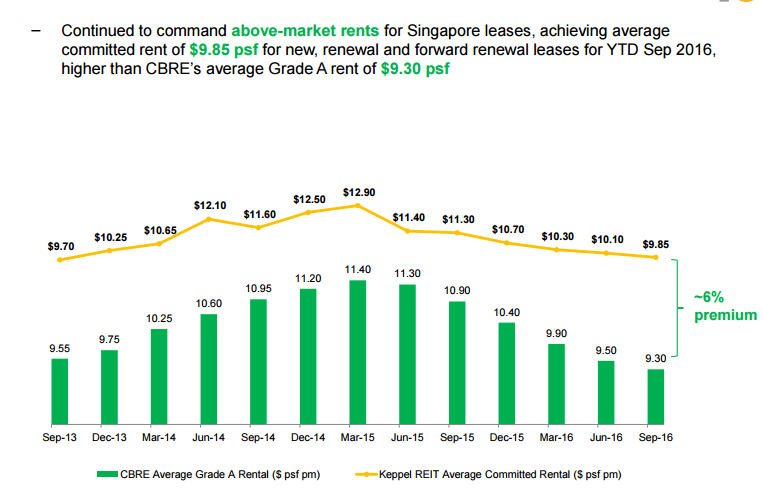 Keppel REIT don’t seem to be having much problems here next year. 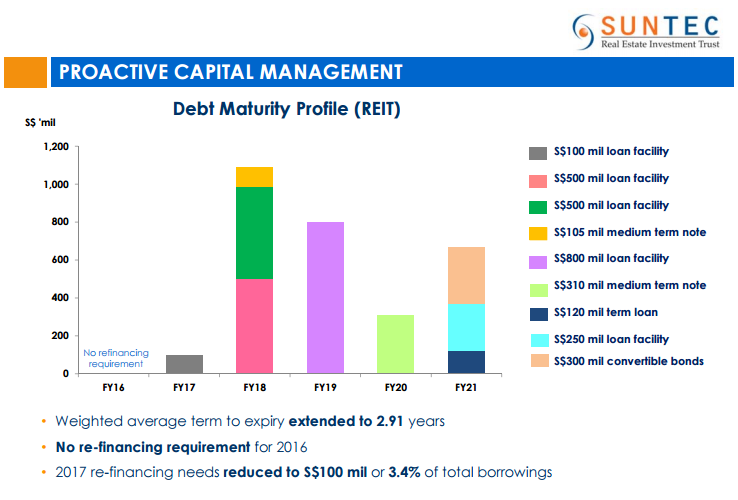 Capitaland Commercial have a small amount of debt to refinance. 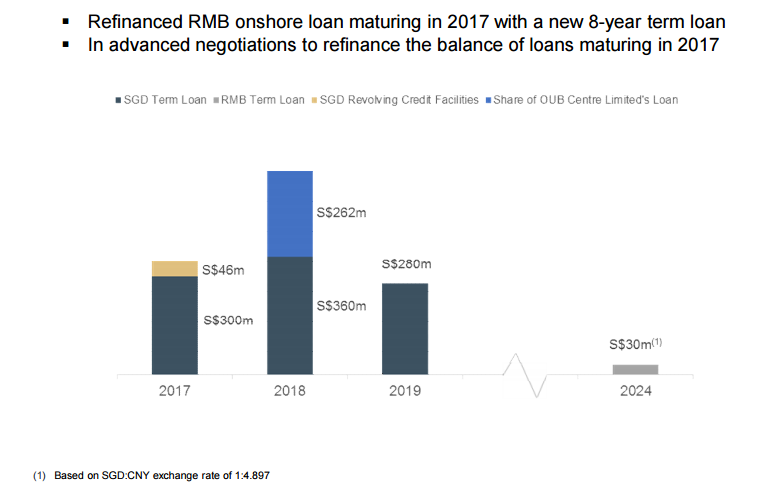 OUE have 29% of their debts expiring in 2017. 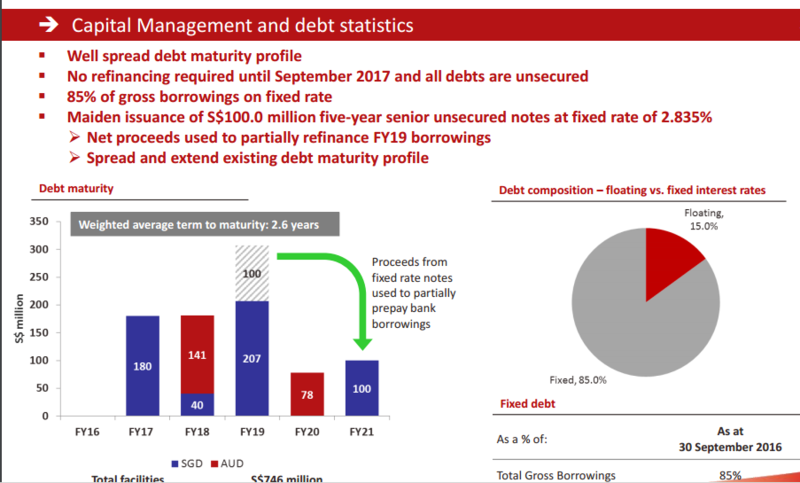 Frasers Commercial have 24% of their debt expiring in 2017. Finally we review some of the industry figures to get a sense of the operating climate. 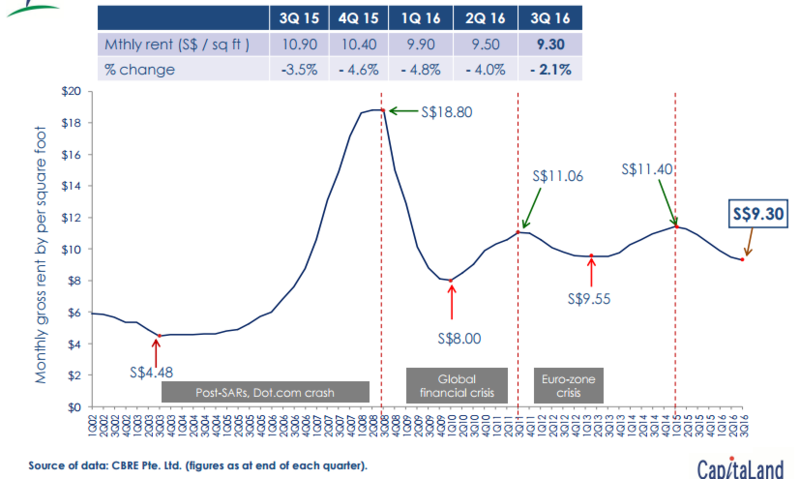 The above slide was taken from Keppel REIT. Like the period of 2010-2012 there are much supply, but at least in that period, the demand was better. Guoco Tower, Marina One and DUO are the last supply. After which there is only the new Frasers Tower which will only be ready in 2018. Strangely, when we compared to the past, growth has slowed down the past 2 years, yet we have not reached the negative demand scene in the last 2 stock bear market in 2000-2003 and 2009. The mix of tenants have evolved. We can see a very banking and finance centric mixed from 2004 to 2010. In the last few years they have been replaced by a broader mixture. In this slide, you can compare the office supply versus that of other major cities. 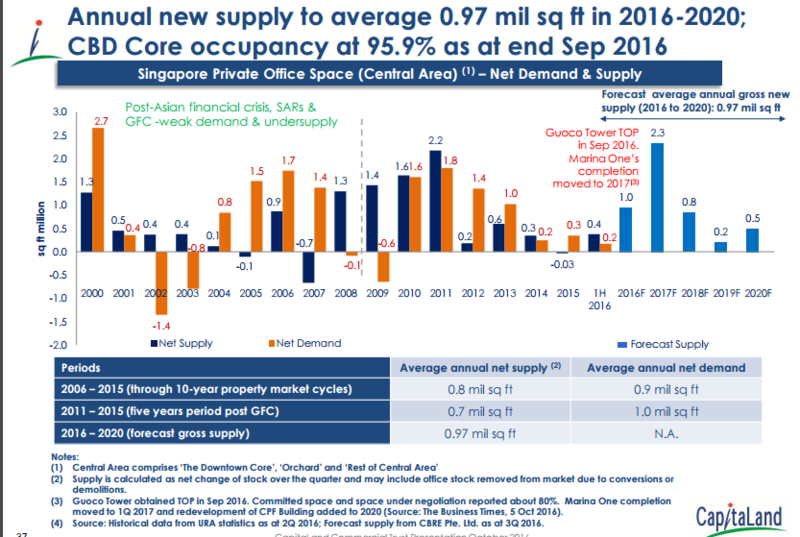 Supply is lower in Singapore versus the other major cities. However, much will depend on the economic vibrancy of the various city, how well the demand is able to absorb the supply. 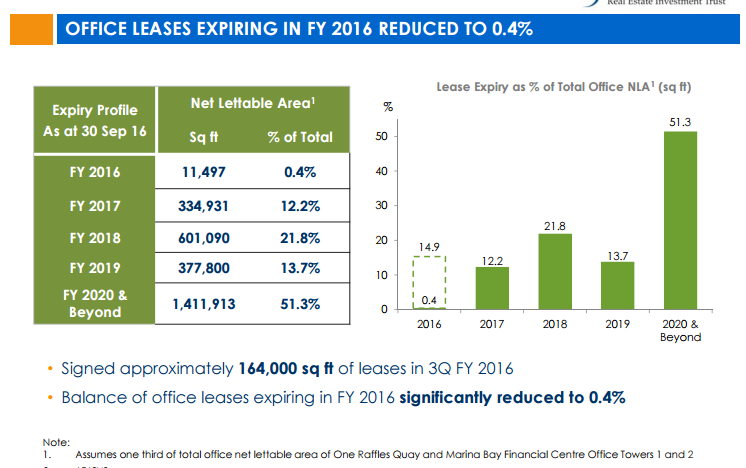 Net absorption rate shows the amount of office spaces rented out at the end of the period minus the amount rented out at the beginning. A high figure, shows strong take up. Beijing have seen a surge in 2011, then taking a few years to digest the supply. Shanghai and Tokyo show strong absorption. 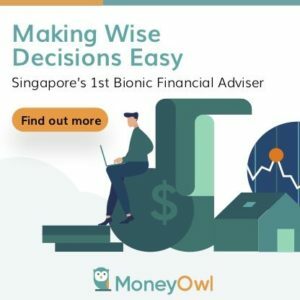 Singapore have performed better than Hong Kong, however the absorption rate have slowed. One interesting data point was provided by Macquarie Research in that, it is showing a consistent 16-17k foreign workforce addition. The Foreign workforce stayed strong at 780k. However, it seems we do not have the 2016 data. This data point on the right shows that while gross rent can fluctuate widely, low rent does not always mean low occupancy. 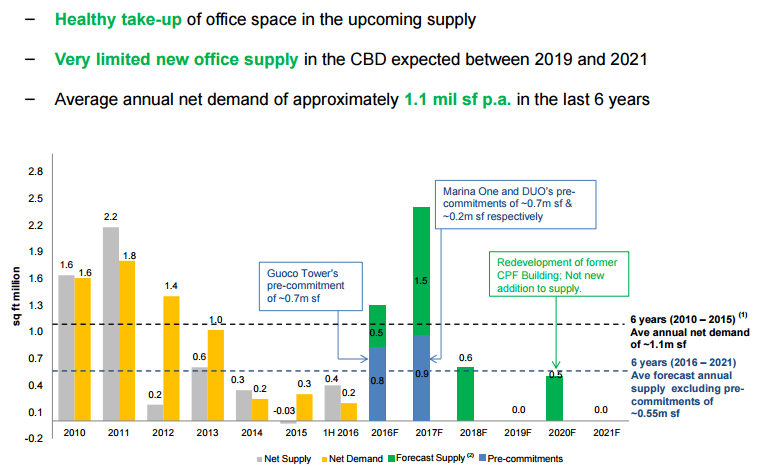 The above data from Macquarie Research is interesting in that they raised to investors the rise in supply due to amount of prime office space that came onto market in 2011-2012. The rents declined 20% and they bottomed out at SG$9.93 versus the current rent of SG$9.74. Thanks for the very detailed articles on Reits. really appreciate your hard work and willingness to share your knowledge. Can’t find this level of detailed information from any book or investment magazines. Leaning slowly from reading your analysis articles how to approach a company in a systematic manner—very helpful! Any chance you can do an analysis of Healthcare related reits as well? Hi Doji, let me see if I can find a good angle to write about. I used to write a fair bit on the healthcare REIT in the past so hopefully I have the energy to refresh some of these. where to get these research reports from? Hi Bruce, you can get them from brokers. Or that you need to have brokers who have assess to these reports. I find your analysis refreshing and from your portfolio, it seems like you are vested in Frasers Commerical Trust. Out of these, are you more comfortable with Frasers Commerical Trust? i got invested some time ago. there are more risks as you can see, so i have some confidence they can pull through and do good. we will see. Recently, Reits are slightly on the downtrend due to impending rate hikes due to Donald Trump possible aggressive fiscal policies. Will you be looking to buy even more Reits (Frasers Logistic which you had done a great analysis) or keep in the sidelines first?